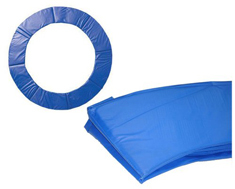 Etan 10ft InGround Trampoline. Easily inserted in ground without having to dig a massive hole Galvanised steel throughout. 2.1 x 42mm steel. Will take much more use than any other make Dutch supplied. No need for an obtrusive in your garden with this in-ground 10ft trampoline. Won’t blow away in a storm! Small bowl shaped hole, see recommendations Good drainage required with or without a Safety Enclosure Dutch supplied.